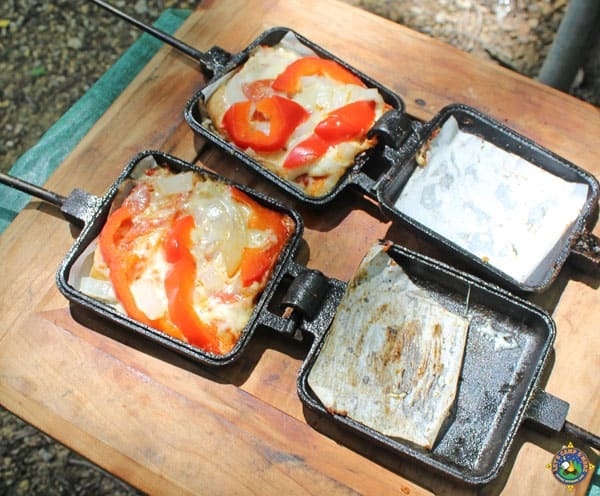 Make a Frozen Pizza over the campfire on your next camping trip. If you have read our blog much, you will notice that we like food that is easy to prepare. 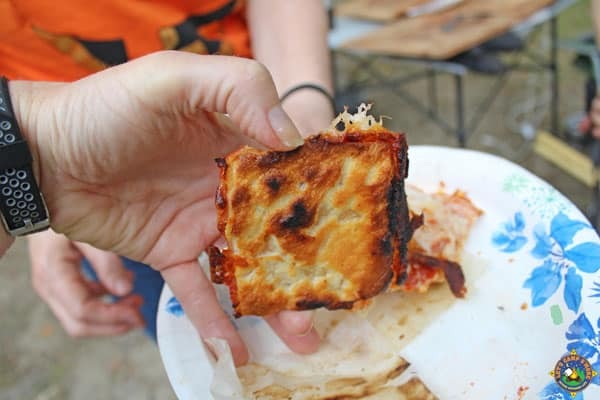 This simple camping food hack of frozen pizza while camping is not only easy to prepare, it is fun. This idea came from our camping friends Peggy and Paul. They are one of her favorite couples to camp with. Peggy has already contributed to recipes to this blog. Her Rhubarb Crunch is a favorite, but you will also like her Apple Crumble. I am sure that we will come home from our camping trip with another recipe of hers to share. 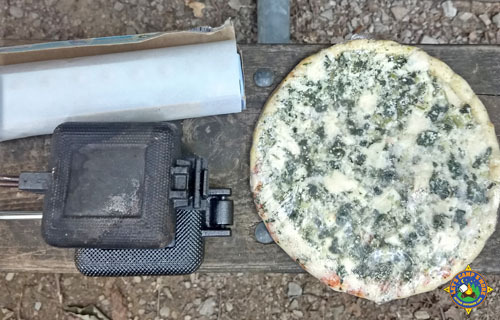 Everyone loves pizza, but how do you heat up a frozen pizza when you are camping? Simple, cook it over the campfire. 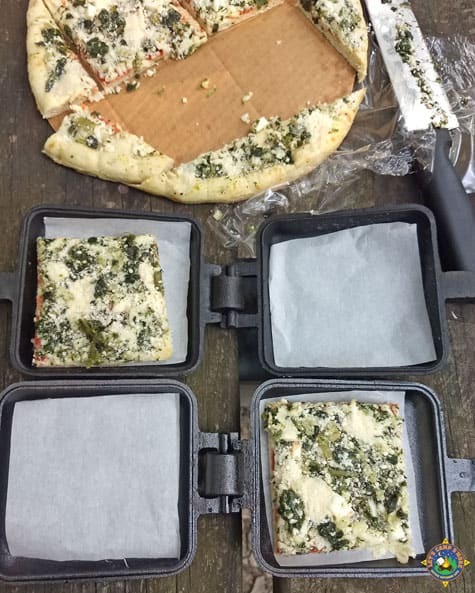 Placing a frozen pizza straight on the grate over the campfire doesn’t work because the top will not cook. Peggy and Paul like to cook individual pieces of pizza in a pie iron. Bring your favorite frozen pizza out to the campground with you. The pizza will thaw a little bit in the cooler but that is okay because it is easier to cut it before you cook it. Cut two pieces of parchment paper a little bigger than your pie iron. 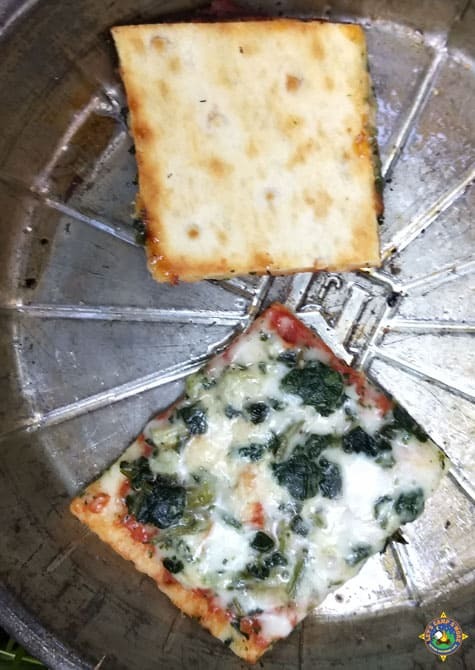 Cut a piece of pizza to fit inside your pie iron. Sandwich the piece of pizza between the pieces of parchment paper and place inside the pie iron. Cook the pizza over the campfire until desired crispiness. The pie iron can be opened up to check on the pizza and then closed again to cook longer. We strongly recommend that you get a pie iron that is made out of cast iron. It is going to give you a better cook on anything that you cook within it. Food tastes better cooked in cast iron! How fun is this simple cooking hack? It takes an ordinary cheap frozen pizza in makes it tastes fantastic. We want to think our camping buddies for sharing their great idea with us. 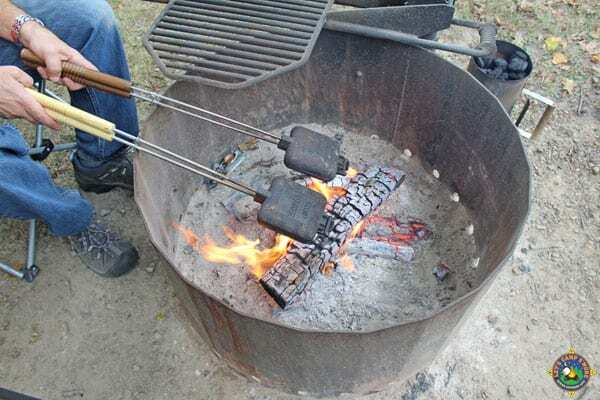 Do you have any camping recipes hack or other ideas that you would like to share? Click here to see how you can be featured here at Let’s Camp S’more. Great tip! I will have to remember this next time we go camping! Sharing! Thank you for sharing on Merry Monday! Hope to see ya next week! I just bought one of these gadgets 2 days ago! When I showed my hubby he didn’t get what it was for. Pizza, grilled cheese sandwich, Portobello panini yum yum yum! We are camping with my parents soon and they think every meal should take 2 hours to prepare and involve red meat and baked potatoes. I’m totally going to pull out a frozen pizza (on grocery shopping day) and dazzle the kids! Tee hee! Thanks for the inspiration! They will love it. PLUS it can make a cheap pizza taste great!